I went looking on the “BD Selection” website to see if a new Blacksad album is out in France. No; but this sounds interesting. 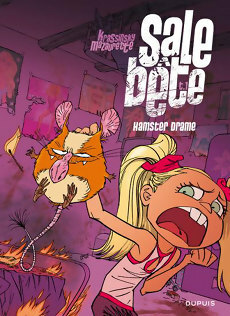 Here is my translation of the French summary/review of Sale bête, T. 1: Hamster drame (Filthy Beast, vol. 1: the hamster catastrophe) by “Boris”. You Little Thing, you’ll get yours! For her birthday, her parents give their second daughter a hamster entirely made of pieces that have the usual hamster characteristics. But following a problem in the manufacturing process, the resulting animal is ugly, nasty, and evil. If it’s not to a preadolescent’s taste, her older sister who is a rebellious teen will gladly take it! This first volume of Filthy Beast (Sale Bête) is a winner first of all for its accurate and vitriolic portrait of a typical modern family with few principles, and ready to compromise those whenever convenient. Their problems are numerous, varied, and often amusing. Unfortunately, during the course of this album, the story is somewhat disorganized – certain events seem unnecessary (the scenes in the kennel, at the Elysée), padded, and lacking in originality. This is especially unfortunate because this series has so much going for it, notably the distinctive and often surprising artwork by Jean-Paul Krassinsky. The grandeur and decadence of a horrible, ugly, and very very evil transgenetic hamster! For the birthday of a totally fashion-conscious preadolescent, what could be better than a hamster signed ‘Mattonvu’? Nothing. Not even Britney Spears herself has such a hamster. Amandarine’s father has no other choice than to order such an animal from ‘La Fabrique’, a company specializing in the creation of pets to order. But, after a malfunction somewhere in the manufacturing process, the cute little beast is replaced by a sort of rat that is extremely ugly, frankly stinky, as sneaky as it is evil, and gross beyond limit. Immediately named The Little Thing, it is, despite its faults, adopted by the family. The debut of Maïa Mazaurette, teamed up with Jean-Paul Krassinsky, in the field of comics albums, with an album as funny as it is irreverent that reformats the concept of pet animals. Who knows if it will be published in English? Sale Bête, T. 1: Hamster drame. Written by Maïa Mazaurette. Art by Jean-Paul Krassinsky. Publisher: Dupuis (January 2012; 54 pages, €10.60). And it turns out that the Sale Bête series is originally serialized in Le Journal de Spirou.